Paul Kruger and Dannell Ellerbe were the big names that got the biggest money. LaRon Landry is the big dude with as high an IDP ceiling as any defensive back in the league. If you play in an IDP league, you no doubt paid attention to those free-agency situations. But the savvy fantasy owner knows to always keep an eye open for sleepers. With that in mind, here are 5 free-agent moves that you might have ignored -- along with a few fantasy football draft tips. 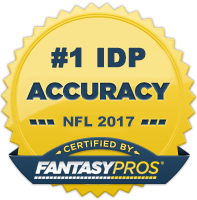 Two years ago, Chung left the board among the top 10 defensive backs in IDP drafts. Then he missed half the season with multiple injuries. Still, last summer found Chung among the position's top 20 at draft time. He continued to be selected regularly as a starter. But Chung struggled with health yet again, losing time to shoulder and hamstring issues. He also lost hold of a starting spot, giving way to new teammates Tavon Wilson and Steve Gregory. Fortunately for us IDP owners, the Pats let him walk and the Eagles snapped him up. They didn't just do so with a 1-year "prove it" deal. The Birds will give him $10 million over 3 years, including $4.5 million guaranteed over the first 2 seasons. That says Philly views Chung as a starter. Head coach Chip Kelly knows the guy from their shared time at Oregon. Kelly served as Ducks offensive coordinator for Chung's final 2 years there. The Eagles need to replace both 2012 starters from the back end, and Chung brings the kind of physical presence Kelly wants all over the defense. In addition to 100-tackle potential, Chung grabbed 6 INTs and defensed 18 other passes despite missing so much time over the past 3 years. The Dolphins garnered attention by throwing big contracts at linebackers Dannell Ellerbe and Philip Wheeler, but they didn't necessarily get the better end of the moves. Miami jettisoned Burnett shortly after signing Wheeler, and he made his way west to sign with Wheeler's old team. Burnett is older than Wheeler, but only by 2 years. He'll turn 31 near the end of the 2013 season. And Burnett carries a whole lot more starting experience. He manned an inside linebacker role in San Diego, starting all 16 games there in 2010. That season saw him deliver 6 sacks and grab 2 INTs to go with 80 solo tackles in his first crack at full-time starting. He followed that by moving to Miami as a free agent and topping 100 tackles each of the past 2 years. According to Pro Football Focus, he played better overall than Wheeler in 2012 -- thanks largely to much stronger run defense. Playing next to MLB Nick Roach in Oakland instead of Karlos Dansby in Miami should leave more tackles on the field for Burnett. He finished 2010 as the No. 15 fantasy LB. He checked in a respectable 26th and 34th the past 2 years. Wheeler began his lone Raiders season on a fantasy tear. Then the first-time starter fell off late. Burnett is capable of doing the same things and has played 16 games for 3 straight years. He'll come at low cost on fantasy draft day and likely have little trouble outperforming it. In 2011, Pro Football Focus rated Barnes the 8th-best 3-4 outside linebacker in the league. That included the position's 6th best grade in pass rushing. He rocked 11 sacks that season despite playing less than half of San Diego's defensive snaps. Then the Chargers signed OLB Jarret Johnson and drafted OLB Melvin Ingram in Round 1. And Barnes' playing time slipped further. Still, he delivered 15 total QB disruptions -- sacks + hits + hurries -- in just 140 pass-rushing reps. With the Jets, Barnes immediately becomes the team's top pass-rush threat. Rex Ryan is reclaiming play-calling duties and is sure to put Barnes in position to do what he does best. Look for a career high in playing time and big sleeper potential in leagues that reward pressure stats. The Saints probably wouldn't be switching to a 3-4 front if they didn't believe they had some pieces already in place. Re-signing Galette to a 3-year deal indicates that he's one of those pieces. Galette spent his first 3 seasons as a pass-rush specialist at DE for the Saints. He racked up 9.5 sacks in that role over the past 2 years, adding 17 QB hits and 38 hurries. That's a lot of pressure from a part-time player. And LB won't be entirely new to him. He spent his first college season there at Temple before moving to end and then transferring because of off-field trouble. At 6-foot-2, 257 pounds, Galette is built more for the standup role. And that's what NFLDraftScout.com thought he'd be coming into the league. Galette looks like a starter under new coordinator Rob Ryan and a candidate for 10+ sacks. If he retains DL eligibility on some league-management sites, he could expand his sleeper profile. Oakland hoped it had a future starter when it made Mitchell a surprise 2nd-round pick in 2009. He never grew into that. To be fair, though, the Raiders were pretty well set with Tyvon Branch at strong safety. So Mitchell has moved on to Carolina. Head coach Ron Rivera told the Charlotte Observer: "He's a young football player who hasn't played a lot of football. But what you see says he's a guy we want to find out more about and give him an opportunity to compete." Charles Godfrey has moved from strong safety to free. That leaves Mitchell facing Haruki Nakamura and D.J. Campbell for the strong job. Mitchell said the opportunity drew him to Carolina, so coaches must have told him he'd have a chance to start. At 6-foot-1, 216 pounds, Mitchell could prove a prototypical in-the-box safety. You can find Matt Schauf on Twitter (@mschauf63).